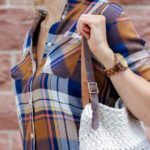 Learn how to add leather handles to a crochet bag or purse to add instant sophistication, strength and texture. For me, one of the things I love most about fiber arts is how much texture you can create from a simple strand of yarn. Many of my projects, like my recent Canyonlands Boho Top or Coachella Boots with flip flop soles, begin by just wanting to make the yarn I’m using really look as rich and full of detail as possible. 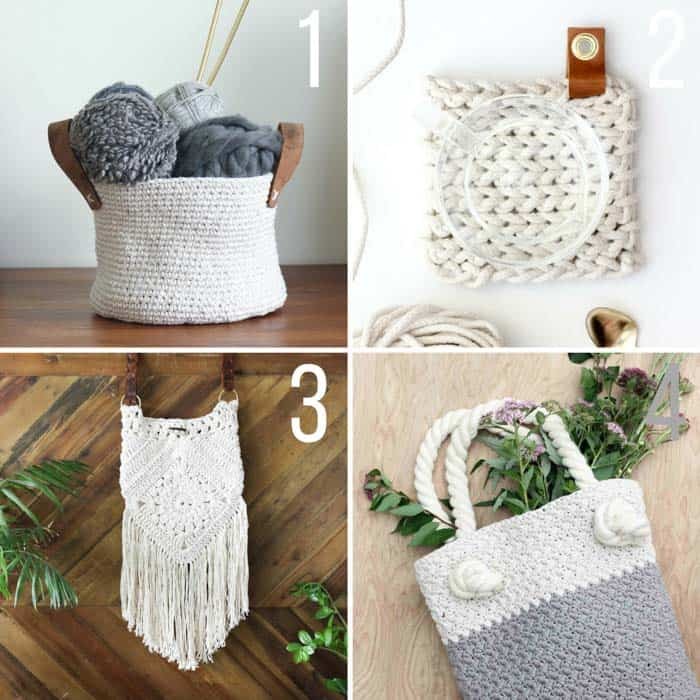 One way I think we can draw attention to the texture of our crochet or knit projects is by juxtaposing them against something with a completely different texture. 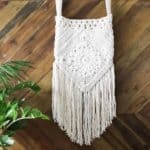 I find myself often gravitating to leather for this reason because it offers such a contrast to the soft, yet bumpy stitches of knitting or crochet. 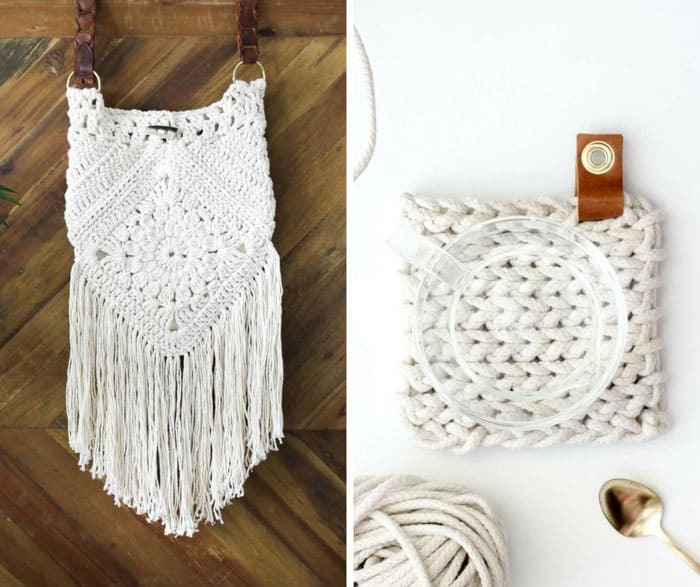 You can see how nicely cotton yarn and leather play together in the Urban Gypsy Boho Bag pattern and the Clothesline Rope Trivet below. 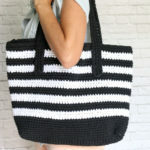 When I was making The Audrey Tote recently and saw how gorgeous simple single crochet stitches looked in the Lion Brand Fast-Track yarn, I knew I’d also want to try to add some leather to further amp up the texture quotient. A handful of shiny gold rivets later, I think textures of The Audrey Tote are singing in harmony. 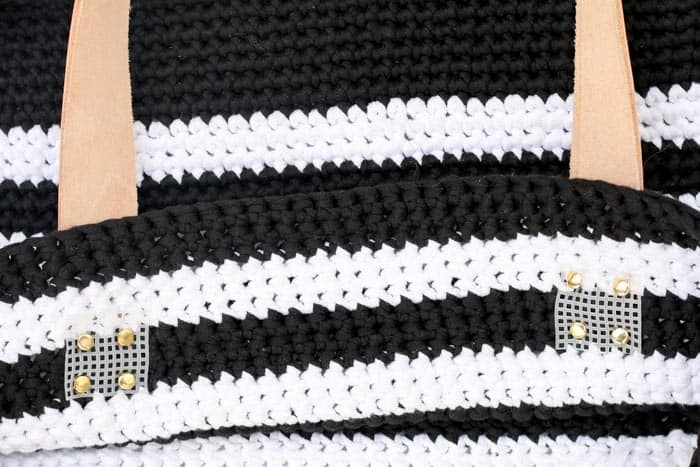 Until now, I’ve hesitated to use rivets directly on crochet or knit fabric because the rivets would just pull through the spaces between the stitches. Then I came across this sewing tutorial from the Polka Dot Chair though that uses plastic canvas to stabilize the bag handles. 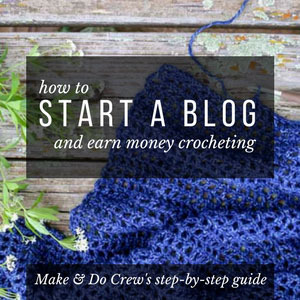 It finally solved the problem I’ve always had with using rivets and I think it’ll work well for many of your crochet and knit projects too! 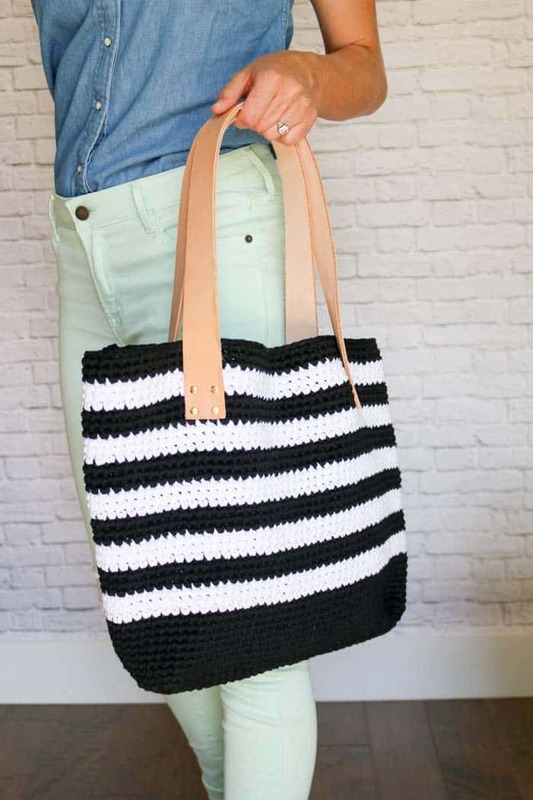 Today I’ll show you how to add leather handles to a crochet bag, but feel free to take take these basic concepts to design leather straps and handles that suit your style and the bag you’re making. 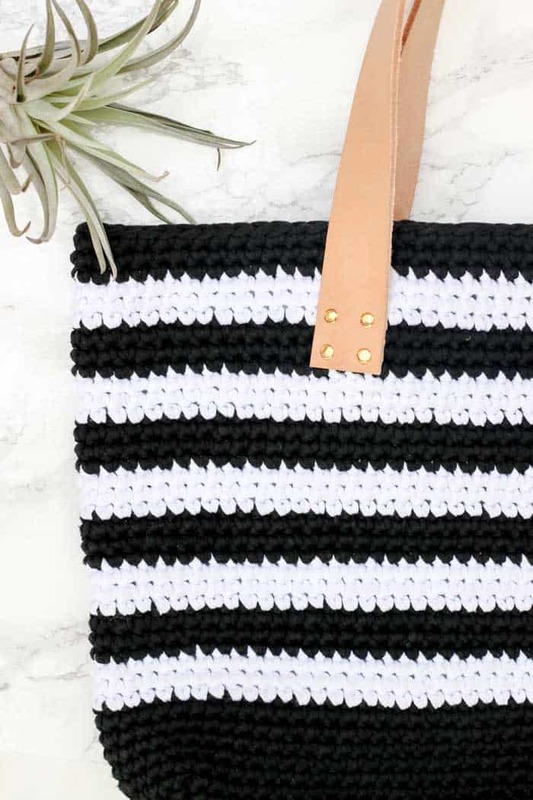 While I found a great deal on the supplies for this bag on Amazon (linked below in the “supplies” section), I also love using thrifted leather belts as accents on crochet projects, like I did in this Dollar Store twine basket! 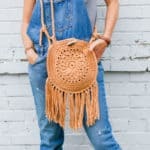 So you can spend more time making handbags and less time shopping, this post contains affiliate links at no extra cost to you. • It’s helpful to work on a hard surface when you’re hammering the rivets. 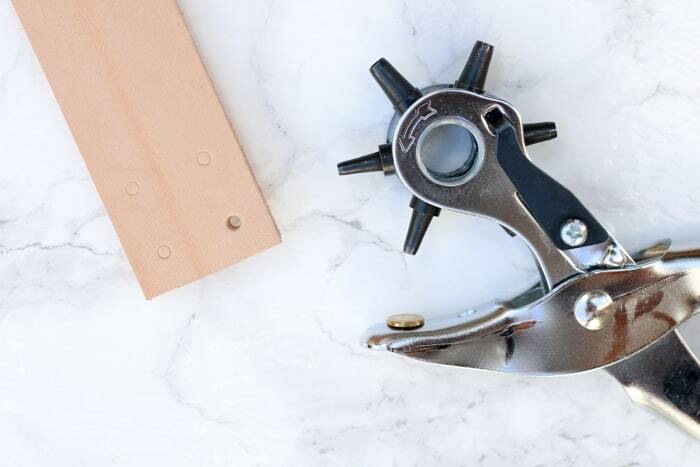 It’s also a good idea to lay a sheet or cloth down under your project so the rivets don’t get scuffed in the process. 1. Use leather punch to gently score leather and mark placement of four holes in both ends of each strap. When you’re happy with the marks, punch all holes. 3. Now you’ll make a “sandwich” of all your supplies to attach the first strap. Place a rivet post (the longer piece) face up on your work surface. With the right side of your leather strap facing down, place the it on the rivet post. 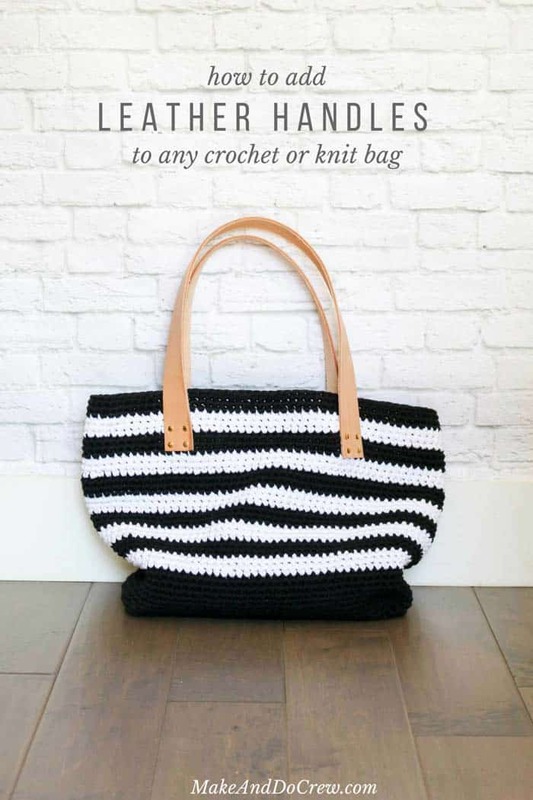 Stack the crochet or knit back on the leather strap, with the right side of the bag facing down. Place one canvas square on top of the bag, threading the rivet post through a hole in the plastic grid. 4. Place the rivet cap on top of the post, with all the other layers squished in between. You may need to press the rivet together with your fingers to get a little tension on it before you hammer it. 5. 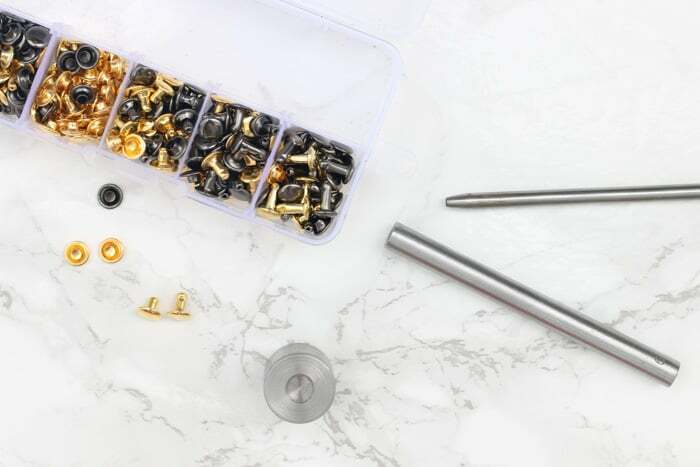 Put the small, wider metal cylinder tool below the bottom rivet cap, making sure to place the concave, curved portion on the rivet cap. Place the long, thinner cylinder on top of the top rivet cap, again being sure to have the curved side on the rivet. 6. Hammer time! You’re going to want to give this a good couple of whacks. After the first one, you should be able to tell if the rivet connected because it’ll immediatly feel more stable and connected than before. 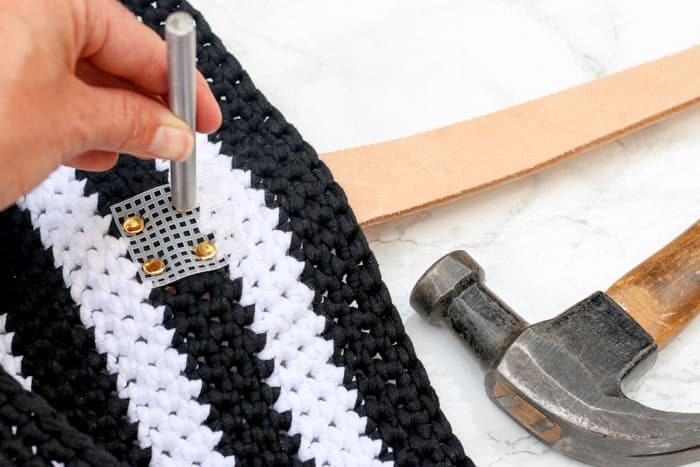 If your crochet or knit bag is made from fairly chunky yarn, like the bag made with Lion Brand Fast-Track pictured here, you may find that one portion of the rivet slips periodically when you’re hammering and you end up smooshing it with your hammer. I did this 3-4 times during the course of adding handles to The Audrey Tote, but luckily, the kit I used comes with plenty of extra rivets. 7. Repeat steps 3-6 with each hole in your leather strap. Honestly, I didn’t understand either until I just started experimenting! 🙂 Now I see that there’s so many possibilities! Glad to hear you’re inspired as well.